Joe Crone is a singer, songwriter, dramatist and educator. His evenings are spent sharing his songs with friends at pubs, coffeehouses and festivals. In the day, he spends his time with his company, "Educationalive", visiting schools for workshops and performing in concerts. When he is not busy doing this, he works with The Royal Conservatory of Music and their "Learning Through the Arts" program. As an artist with this program, Joe works with both teachers and their students, and designs and implements lessons that incorporate the arts into many curriculum areas. He has also developed "The Complete Phonics Program", a music and games based phonics program that has met with much success in helping students master the complexities of the English language. See: www.completephonics.com for more details. Starting in 1989, he has taught music and drama to students from kindergarten through to grade 12, and has been a classroom teacher for children from the 4th to 8th grades. He has taught in the York Region District School Board in Ontario for 12 years and recently on the island of Saipan for 3 years. He is also a regular teacher at the York Region District School Board's Arts Camp, teaching songwriting to students from grade 7 to grade 12. He has specialist certification in dramatic arts from the Ontario Ministry of Education and has recorded 4 CDs of original music for children that focus on curriculum concepts and character education themes. "On the Island" is a collection of his songs for the adult listener. As a teacher and an artist, Joe believes that learning should be a joyful and exciting adventure and should reflect the various learning styles of his students. For this reason, he integrates the arts as much as possible while working with children. And to help parents and teachers do the same, his children's CDs have booklets with all the guitar chords and words to his songs. The CD Geometry Park even has a teacher's guide with step by step instructions about how to integrate the arts into many subject areas.Teaching through music, art and drama creates learning experiences that students will simply never forget! Joe's desire to learn about the world has led him to travels in India, Nepal, Bangladesh, Myanmar, Thailand, Malaysia, Indonesia, Fiji and the island of Saipan. These extensive travels in Asia and the Pacific focused on independent cultural studies including the studying of Tai Chi, Yoga, and Asian religious traditions. Development education was also a focus of these travels and included volunteering at Mother Theresa's Home for the Dying Destitute in Varanasi, India, and creating a craft importing business in order to fund a literacy project for women in the rural Kathmandu valley. His time in Fiji was spent with Canadian Crossroads International working for the department of agriculture and at a sheltered workshop for developmentally challenged adults. 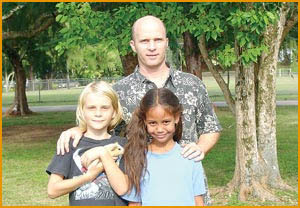 Joe's latest overseas adventure was on the island of Saipan where he taught at Whispering Palms School for 3 years and was known as "Uncle Joe" to his students in grades 4, 5 and 6. At the bottom of this bio is an article that appeared in "Professionally Speaking", the magazine of the Ontario College of Teachers. Prior to teaching Joe worked at group homes for developmentally challenged adults and for troubled youth. He has also worked at summer camps for developmentally challenged adults, youth and children, camps for physically challenged adults, and with Native children from the Moose Factory and Moosonee area in Northern Ontario. "Hi Uncle Joe, I think Snuffybum is going to have more babies." Amber reaches up to give me a hug. Snuffybum is a guinea pig. "Where's that belly button?" That's Colin. Before he starts his day he has to place his index finger into my belly button. Don't ask me why. "Uncle Joe, that was a great hike we went on yesterday, but I thought we were lost for sure," says Steven. He, my son Dylan and I found a great hiking trail through some old-growth forest on Sunday. "Uncle Joe, I've got your family signed up for the tennis tournament this coming weekend," says Uncle Peter, sticking his head inside the door. "Great, Uncle Peter. We'll be there," I respond. I'm looking forward to trying out my new racquet. "I can't wait to go camping on Managaha Island. When do we go, Uncle Joe?" ask both Bo Yoon and Kanani, looking at me with excitement. This isn't a family reunion on a long summer weekend. It's Monday morning in my classroom, about 20 minutes before school starts. 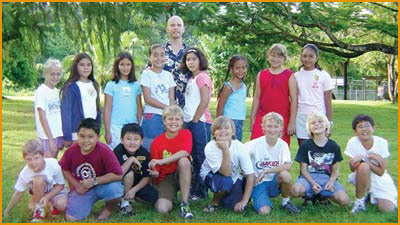 For the past three years I have been teaching at Whispering Palms School on the island of Saipan. Saipan is part of the Mariana Islands. It is a five-by-fifteen kilometre island east of the Philippines, south of Japan, north of Papua, New Guinea - and a world unto itself. Here, I'm known as Uncle Joe to all 52 students enrolled at the school. I teach the 16 students in Grades 4, 5 and 6. In June of 2001, while teaching with the York Region District School Board, I received a call from Uncle Tom - the owner and principal of Whispering Palms. Someone visiting Saipan had passed on my name and phone number to him. He described a school that was a family, where all the teachers and parents were Auntie or Uncle, where the entire school went camping together for three days on Managaha, the island in the middle of the lagoon, where everyone - from Kindergarten to Grade 8 - participated in quality dramatic productions twice a year, a place with high academic expectations and traditions, where love was nurtured. After three weeks of calls back and forth, our family decided to sell ev-erything we owned and move to the other side of the world. During that last phone conversation I remembered to ask Tom what his last name was. That's just the way it is on Saipan. Teaching here has been an incredibly enriching experience. I've had the bounty of being the classroom teacher for my oldest boy, Keenan, for two years, and my youngest boy, Dylan, for one year. This has taught me the importance of developing individualized lessons and expectations that cater to a child's unique needs and abilities. I am a village teacher. My students' parents are my friends. This has made me realize the impact that our words and actions, as teachers, have on the lives of our students. I have realized that the most important thing in teaching is the love and respect in the relationship between a student and a teacher. I have also realized that it is much easier to develop this in a classroom of 16 children than in a class of 35. It hasn't all been roses here. There have been the obvious cultural adjustments for both me and my family. Despite living on a tropical island, I am still a very busy teacher. The di-fference, however, is that everything I do now is directly related to the education and well-being of my students. At a school where there are four full-time staff members, for example, if you want an extracurricular activity to take place, you do it. Because my own two boys have been my students, I've realized first-hand how important those extras are, and I've gladly run the chess club, dramatic productions, pizza lunches and soccer team. I've even learned how to make portable soccer goals out of discarded PVC tubes. Resourcefulness is an asset on Saipan. I'm in the process now of starting an island-wide soccer league. At first, it seemed that moving to Saipan was a tremendous risk. I was letting go of everything that I'd been told was important. But that risk has been repaid a thousand times over in a tremendous amount of personal and professional growth. I will return to Ontario, probably next year, but I'm not sure for how long. It's a pretty fascinating world here, and I feel that I've only just begun. 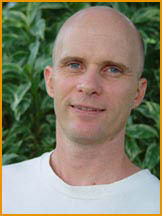 Joe Crone has been teaching since 1989 and is also a singer-songwriter.